but you are citizens with the saints and also members of the household of God. There is virtual unanimity among all faith traditions that now is the time for a just and compassionate immigration policy. Families and communities have suffered the consequences of a broken immigration system, now more than ever we deserve a policy that both meets the needs of families and reflects the best of our values as a country. As we reclaim our identity as a nation of immigrants, Presbyterians are called to remember that we have often taken leadership in the faith community in social movements that seek to repair and reconcile communities affected by unjust policies and to change unjust laws. We must now continue our legacy of action and advocacy on behalf of immigrants and those whom our nation has excluded and marginalized. A group of passionate Presbyterians have gathered to organize a movement within our church that reflects Scripture and our history of standing with immigrants. We are calling all Presbyterians, regardless of immigration status, to join in this effort to bring about just and biblically based immigration policy and ensure the spirit of that policy is made a reality for the future of the church and our communities. No longer strangers and aliens: Presbyterians Believe it! Read this spiritual reflection on immigration and Christianity by Presbyterian pastor, Rev. Juan-Daniel Espitia. Rev. Espitia was born in Mexico City and currently serves as the Associate Pastor at Solana Beach Presbyterian Church. He has been working with immigrants on both sides of the border for 28 years. In addition to being a teaching elder, he is a Licensed mental health clinician but above all, he is a sinner repented saved by grace, attempting to learn what does it mean to be a follower of Christ. 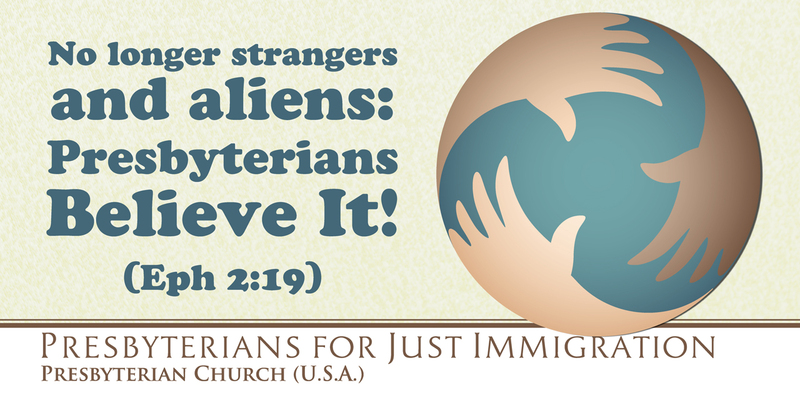 Presbyterians For Just Immigration (PFJI) is a network of Presbyterians interested in various immigration issues and how these issues impact their communities, churches and presbyteries. PFJI is committed to fostering discussion, sharing resources, promoting advocacy, and writing liturgy on various immigration topics. The Presbyterian Church (U.S.A.) is comprised of and led by individuals of many different backgrounds and our communities are typically more diverse. This network serves to empower Presbyterians to share vision, best practices, resources, and a passionate concern for those coming to the United States to live and work. To join this YahooGroup visit the Group page, you will receive monthly updates from the office of Immigration Issues and have the opportunity to "meet" other Presbyterians working on immigration reform. Are you willing to be a part of a national team within the Presbyterian Church (U.S.A.) on immigrant justice? Click here. Click here for the banner graphic. This resource will help Presbyterians understand the provisions of the Form of Government related to immigration and immigrant congregations/fellowships.